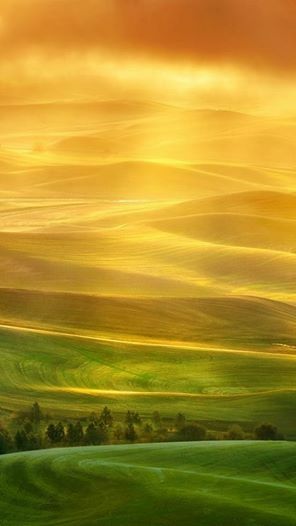 Classic views of Val’Orcia. 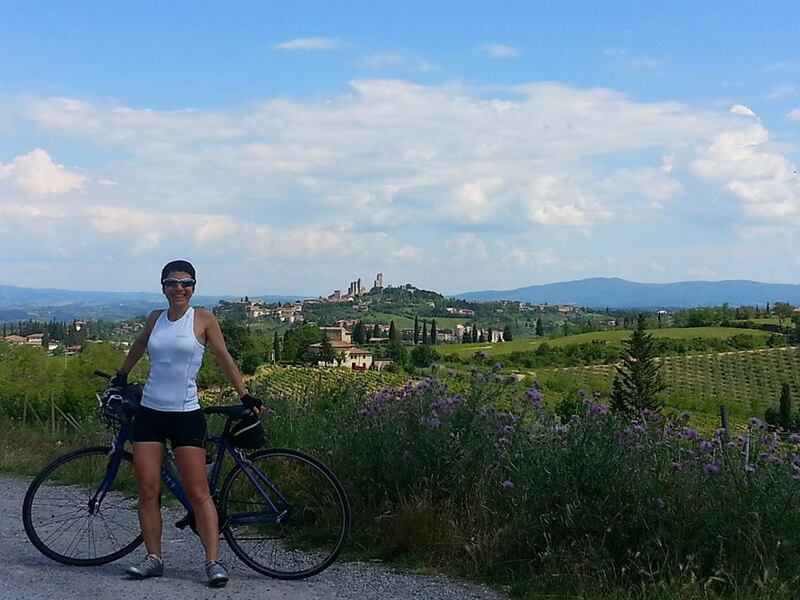 Cycling along quiet roads, through the famed Tuscan landscape. Tuscany, land of cypresses and cradle of the Italian renaissance, is by far Italy’s most famous holiday region, brimming with cultural and natural attractions. There are the marvellous art cities of Florence and Siena, typical villages such as Montalcino and Montepulciano and small medieval hamlets such as Buonconvento and Monticchiello. 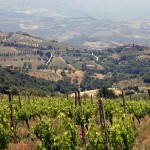 There is the unique Tuscan landscape with its vine yards, cypress lined roads and olive groves, known and loved by tourists all over the world. There is the Italian renaissance art – painting and sculpture alike. And there are the good genuine Tuscan food and wines. 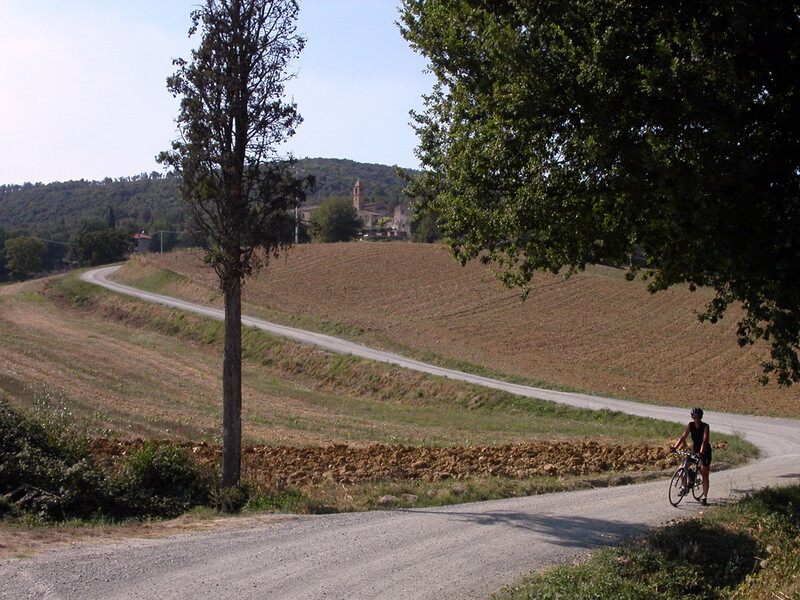 Even with all its tourist bustle, Tuscany still offers quiet back roads and peaceful villages, to be savoured slowly and easily, for example by exploring them on a bicycle. 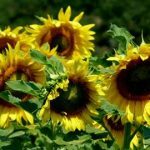 This tour will take you over clouds of sunflower fields under the Tuscan sun along cypress lined country roads and through olive groves and vineyards, from the little town of Buonconvento along broad valleys and rolling hills to famous locations such as Montalcino, Montepulciano and Pienza. You will cycle underneath an extinct volcano to ancient monasteries and have the opportunity to visit delightful medieval hamlets located on low hill tops. 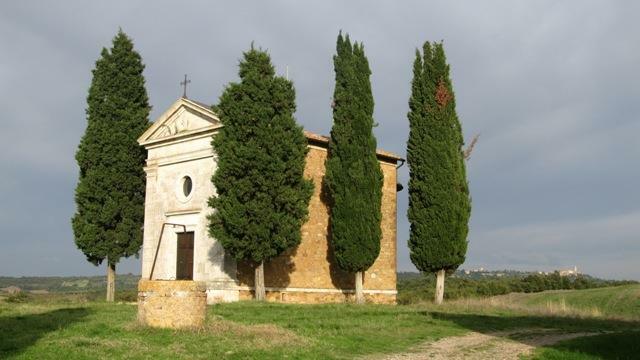 Your trip leads you through the delightful Val d’Orcia area, famous for its wines and quiet, peaceful countryside. 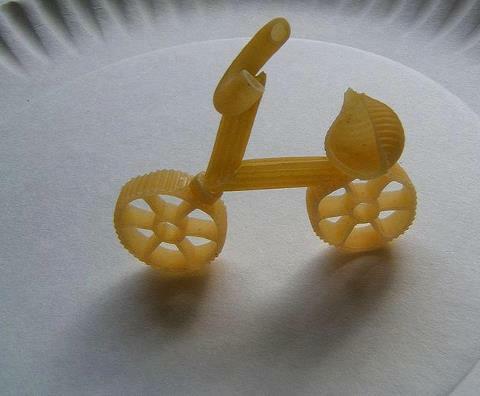 All the while riding on great well paved and quiet roads, ideal for cycling. 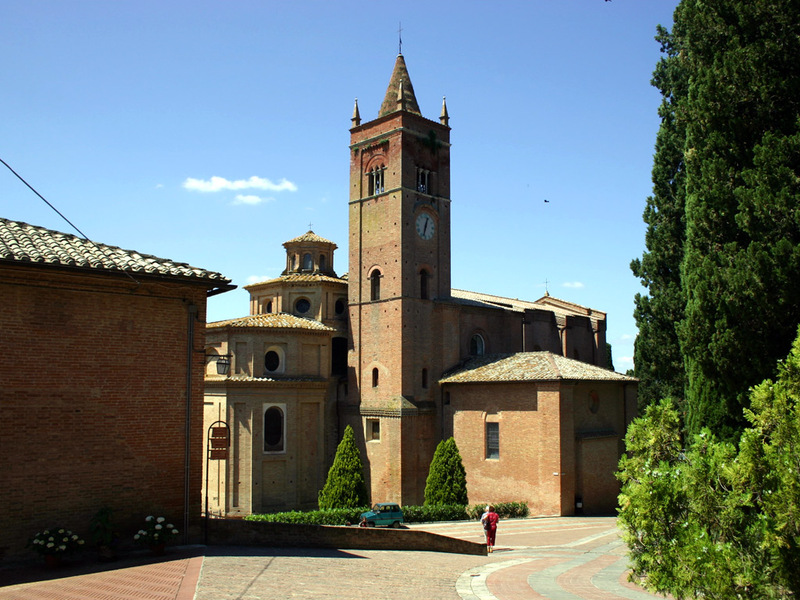 During your tour you will visit the region’s main cultural attractions such as the historical towns of Buonconvento, Montalcino, Montepulciano and Pienza, dominated by their many churches and ancient ‘palazzi’. 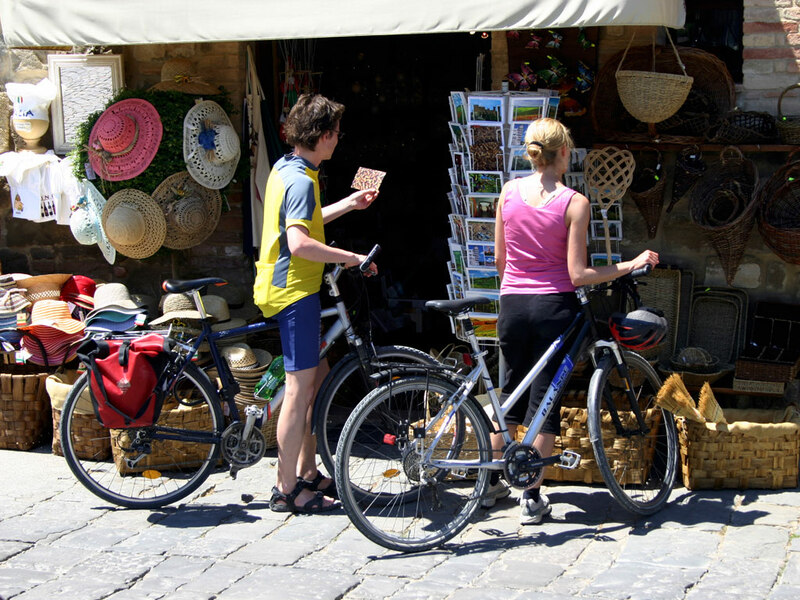 Cycling through the green hills you will be greeted by friendly locals and savour the flavour of traditional local culinary specialties. 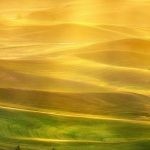 During your tour you will stay in a charming Tuscan farm house near Buonconvento, surrounded by rolling country side full of quiet winding roads and ‘strade bianche’, and in a nice 3-star hotel located in the city of Pienza. 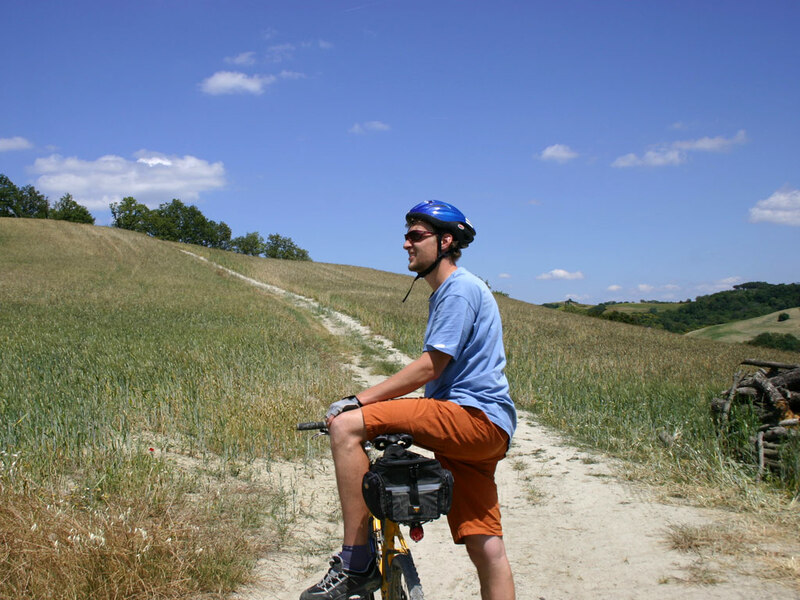 During the first days of your stay you will explore the little town of Buonconvento and its country side, cycling towards Murlo, La Befa and Montalcino. On the next couple of days you will discover the marvellous medieval hamlets of the Val d’Orcia, taking you along the monasteries of Monte Oliveto Maggiore and Sant’Anna in Camprena, and to the hamlet of Monticchiello and the wine producing town of Montepulciano. 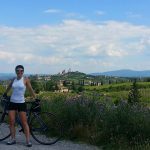 All the while you will cycle through a patchwork of wheat fields, olive groves, vine yards and rolling green hills, dotted with small churches and quintessential Tuscan farm houses. Please note: this is a moderate tour suitable for all those with a basic physical condition. Rides, although passing through rolling hilly country, are short and generally include only a few climbs, leaving plenty of time for sightseeing. 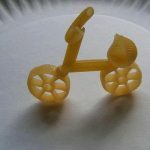 Average cycling times: approx. 3-4 hours each day. Arrival in Florence (or Pisa) in case you arrive a day earlier. Florence airport has regular international flights, while Pisa is served by several low cost companies. From Florence, Buonconvento is easily reached by train. Regular Regional trains have a travel time of about two hour and cost around € 8,00. You will have to change trains at Siena. Also from Pisa there are regular Regional trains, you may however have to change trains one or two times depending on the train; cost is between € 8,00 and € 11,00. Several hotels can be booked in Florence or Pisa, according to your wish (either ‘downtown’ centrally located, or near the train station, ranging from 3 to 5-star). N.B. If you arrive one day earlier you have the possibility to already pay a visit to Florence or alternatively to Pisa, both offering several historical and cultural points of interest. After your arrival at the charming medieval town of Buonconvento, rich in history and architecture with 700-year old walls, a private transfer will take you to your agriturismo (farm house). This will be your base for the next 3 nights. If you have chosen to rent a bike, it will be waiting for you at the accommodation. In case you arrive early you can already have a short ride or go for a stroll and immerse yourself in the tranquillity of the surrounding countryside. In the evening you will enjoy a hearty Tuscan dinner in the agriturismo. After a quick break at Buonconvento in the morning, your day’s trip will take you through the heart of the Brunello wine district. 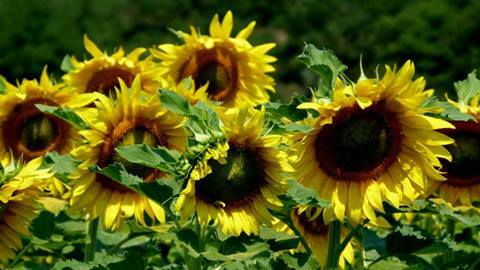 You will cycle under the slopes of the Monte Amiata volcano, through vibrant fields of sunflowers, passing endless olive groves and vine yards on your way to the fortified city of Montalcino. Climb up to the magnificent 14th century fortress and wander through the delightful city centre admiring the ‘Palazzo Comunale’. 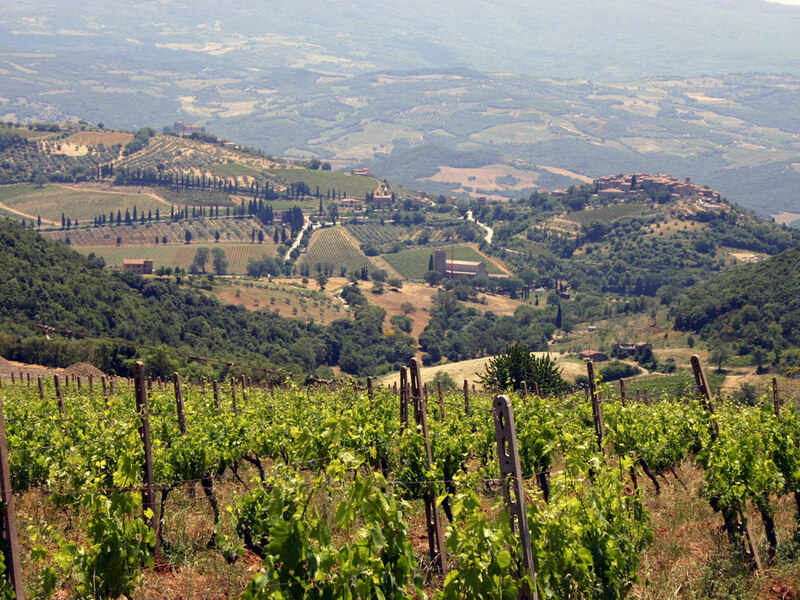 After visiting the city’s main points of interest you may well sit down for lunch and maybe sample the world famous Brunello di Montalcino wine. In the afternoon you then return to Buonconvento along remote back roads, offering surprising views of the surrounding country side. In the evening you will eat again at the agritrusmo, tasting several local specialties. 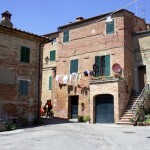 This morning we say goodbye to our agriturismo at Buonconvento and head for the lovely town of Pienza. You first climb uphill to the renowned 14th century monastery of Monte Oliveto Maggiore, a majestic complex of buildings located in a wonderful position above the valley floor. Here you can admire the delightful frescos and its botanical garden. 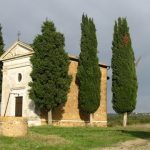 From the monastery you follow a winding route past isolated villages and along country roads lined with hundreds of cypress trees, until arriving at another monastery, of Sant’Anna in Caprena. 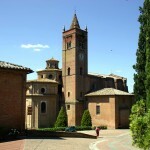 Also this 14th century complex preserves some wonderful frescos and its peaceful gardens invite you to a quiet break. After lunch you will continue on winding country lanes to the lovely little town of Pienza, one of the Val d’Orcia’s best known centres. After settling down in your hotel, you may go out and explore the city, wandering through its back alleys, and admiring its many churches and ‘palazzi’. In the evening you are free to organize your own dinner in one of the town’s many restaurants. 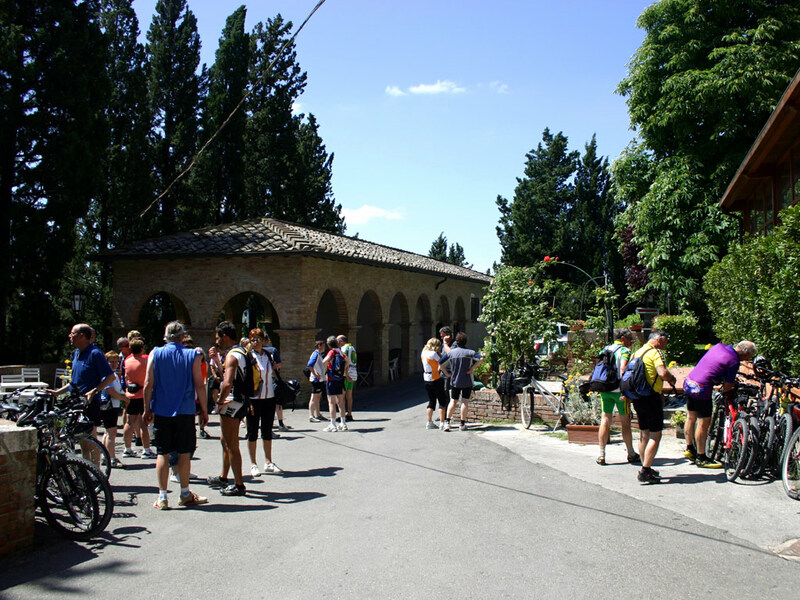 Today is a relaxing day during which you will cycle over the valley’s undulating country roads to the ancient thermal resort of Bagno Vignoni. 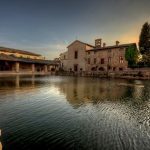 The latter village is famous for its ‘Piazza delle Sorgenti (Spring’s Square), incorporating a large 15th century pool filled up with water from a thermal spring. 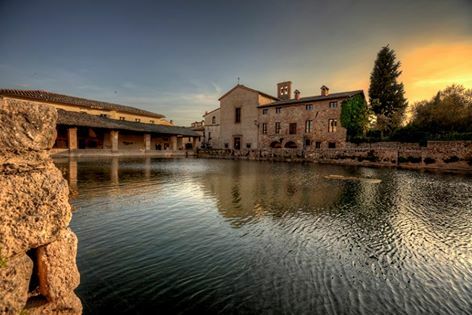 Already under the Romans the spring water from Bagno Vignoni was known for its therapeutic properties. Legend tells that several water nymphs live here. After visiting the village you will turn back to Pienza through the unspoiled country side to enjoy a lazy afternoon next to hotel’s swimming pool. 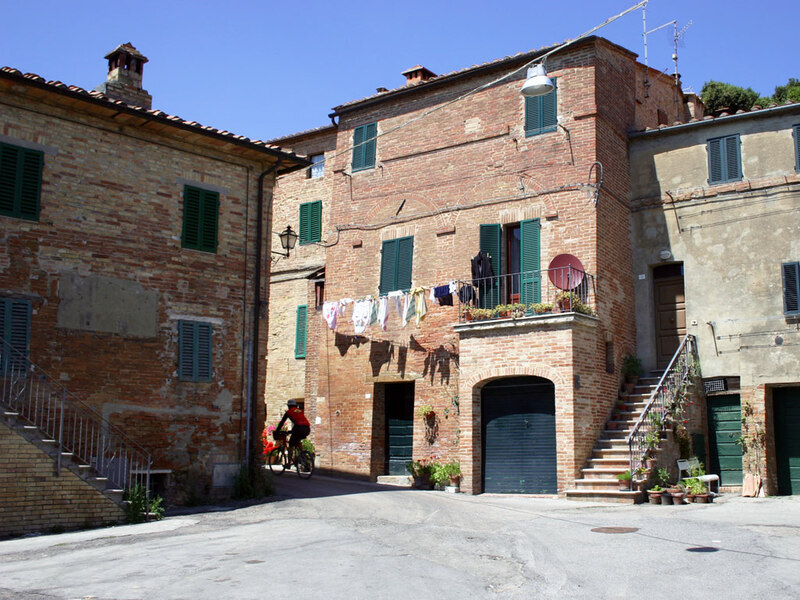 After leaving Pienza this morning you head for the medieval stone-built hamlet of Monticchiello up on a ridge in the undulating hilly country. 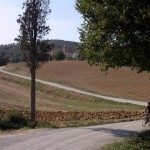 From the hamlet you will enjoy marvellous views over the surrounding country side, with Pienza on the horizon. 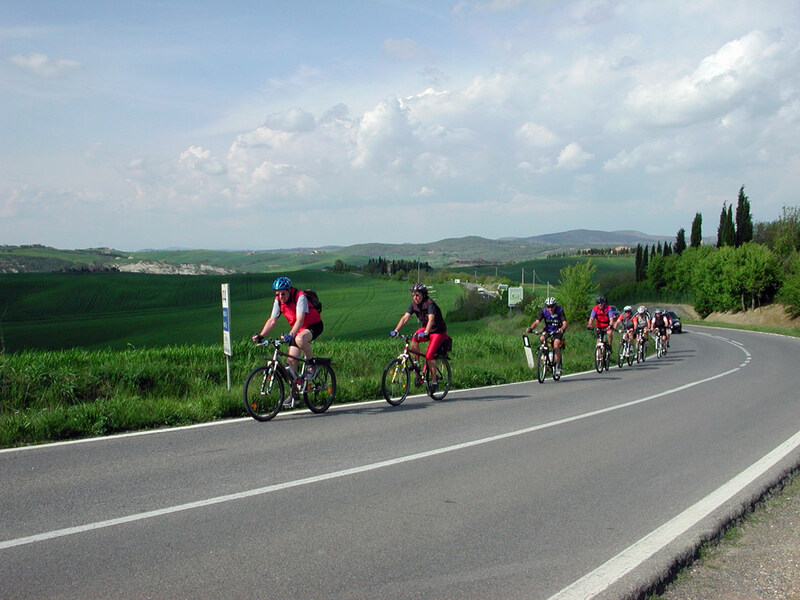 You now cycle along an incredibly panoramic road, up the remarkable limestone ridge of the Val d’Orcia. The rolling cultivated fields now and then make way to small patches of forests. 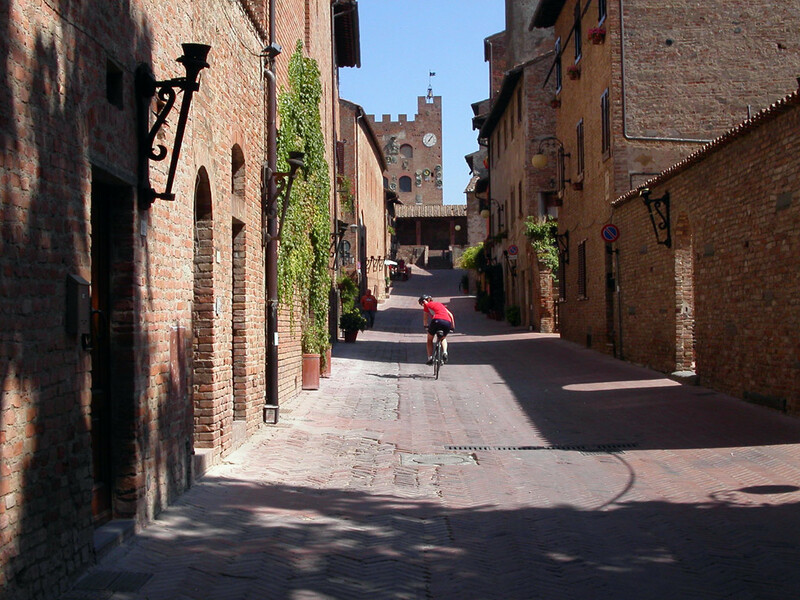 To reach Montepulciano you will have to gather your strength as the beautiful medieval town centre is located on top of a low hill. Take your time for a thorough visit of the town, admiring the Duomo, its many churches and ‘palazzi’ and its two monasteries. Montepulciano not only is rightly famous for its locally produced ‘vino Nobile di Montepulciano’, but also as the set where large parts of the movie ‘The English Patient’ were filmed! After your visit and lunch, you will then head back to Pienza in time for dinner, for which you can choose one of the many typical ‘osteria’ in town. 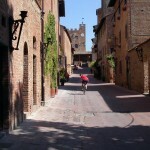 Today you will turn back from Pienza to Buonconvento. Your itinerary offers a brilliant medieval experience, following the ‘via Francigena’, an ancient pilgrimage route passing through the whole of Tuscany on the way to Rome. Along your way you will pass by the fortified town of San Quirico d’Orcia, located on a low hill between Montepulciano and Buonconvento. Here you can promenade the narrow streets full of well-preserved history, or visit the 16th century ‘Horti Leoni’ botanical garden. 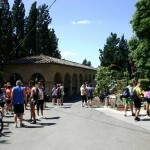 You will then continue towards the agriturismo at Buonconvento, passing over the medieval bridge over the Tuoma river and cycling along a ridge offering a 360 degree view of Southern Tuscany’s majestic landscape. After arriving at Buonconvento you may want to pay a last visit to the historical town centre, before returning to the agriturismo, where in the evening you will enjoy a delicious Tuscan dinner. The tour ends in Buonconvento after breakfast today. A short private transfer can take you to the local station for your train journey to Florence or Pisa. A taxi transfer to other destinations can be arranged on request. All nights are spent in a beautiful, characteristic agriturismo or a nice 3-star hotel. All rooms have en-suite facilities. Dinner: Included on the nights you are staying at the agriturismo (1-3 and 7). On the other nights you have the opportunity to eat out in the town of Pienza. No picnic lunches are included, but can be prepared for you by the accommodation holders, or materials for picnics can be purchased in the villages you pass on your way. Nights 1 – 3 and 7 :These nights are spent in a beautifully located, ‘organic’ agriturismo near the village of Buonconvento. Nights 4 – 6 : These nights you will stay in a nice 3-star hotel with private swimming pool in the town of Pienza. Moderately easy (2/3): Mostly easy rides with only few moderate climbs, only occasionally quite steep. All roads are well paved with a few short unpaved sections. They are mostly quiet with little traffic. Extensions or shortcuts are possible on some days. Fitness: The trip requires a basic physical condition. Day-to-day rides are relatively short (up to 40 km). 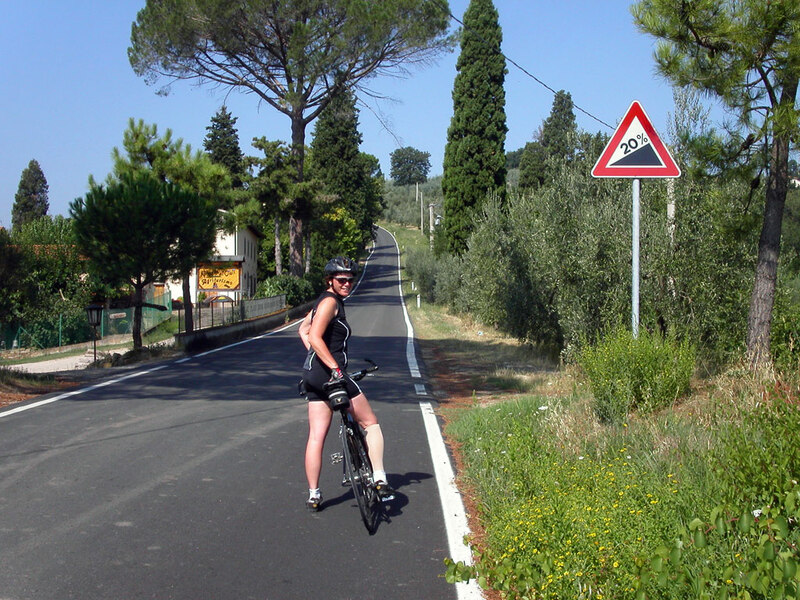 They sometimes involve moderate climbs, only occasionally steeper ones. 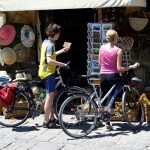 Relative short cycling distances mean you have plenty of time for sightseeing and sampling local culture, and cuisine. Arrival: The tour starts in BUONCONVENTO which can easily be reached by train from either Florence or Pisa. Florence and Pisa both have international airports. Tours start any day during the trip season. Departure: The tour ends after breakfast on day 8 in BUONCONVENTO. A short transfer can bring you to the local train station, from where Florence or Pisa are easily reachable. A shorter 5-day version of this tour is available. This tour is a centre-based tour and includes days 1, 2, 3, 7 & 8 of this programme. It is possible to include extra nights in any of the accommodations ‘en route’. Extra cycling and/or sightseeing options can be provided! 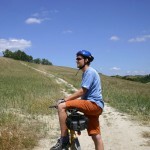 As well is it possible to extend your tour with a few days in Tuscany (Siena, Florence, Pisa or any smaller locality). Details and prices on request.